A two-time All-American in college who set a Southwest Conference career rushing record despite splitting time with Craig James, Dickerson was taken by the Rams in the first round of the 1983 NFL draft (second overall). An upright runner with speed as well as power, he moved into the starting lineup in new Head Coach John Robinson’s ground-oriented offense. 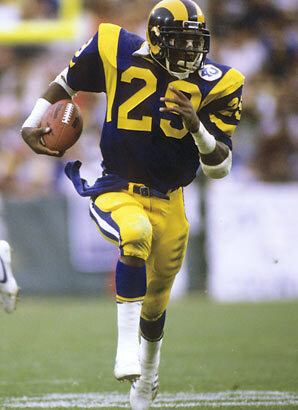 After setting a rookie rushing record in 1983 with 1808 yards, Dickerson went a step farther in ’84 as he set a new single-season record with 2105 yards on the ground. He was a consensus first-team All-NFL and Pro Bowl selection in 1983 and ’84 but, due to a contract holdout and nagging injuries, Dickerson’s rushing numbers dropped off to 1234 yards in 1985, although he still scored 12 touchdowns. Rams went 10-6 to finish second in the NFC West and qualify for a Wild Card playoff berth. Lost NFC Wild Card playoff to Washington Redskins (19-7). Dickerson gained over a thousand yards in all four of his seasons in LA, but contract disputes and holdouts also occurred on a regular basis and in a blockbuster midseason trade in 1987, he was dealt to the Indianapolis Colts. He gained a total of 1011 yards in just nine games in that strike-shortened season, and once more led the league with 1659 yards in 1988. With the Colts, he was a consensus first-team All-Pro in ’88 and was selected to the Pro Bowl in 1988 and ’89. Injuries began to take a toll from 1990 on, and he moved on to the Raiders in 1992 and, briefly, Atlanta in ’93 before retiring. In all, he ran for over a thousand yards in each of his first seven seasons and gained a career total of 13,259. He also scored 90 rushing touchdowns (96 in all). Dickerson’s #29 was retired by the Rams and he was inducted into the Pro Football Hall of Fame, Class of 1999.